In this example, we'll go over each feature and unique customizations we were able to do for NET Carb Club, a website dedicated to low carb diets. Once you have read this case study, we encourage you to demo the actual program using the link below. To start, their tracking program was customized with all of the basic styling changes needed to match their brand. This means their name, logo, mobile icon and brand colors. The end result is a tracking program that feels like a natural extension of their company. If their brand changes or, for example, they adopt a new logo, all of these settings can be changed within their control panel. 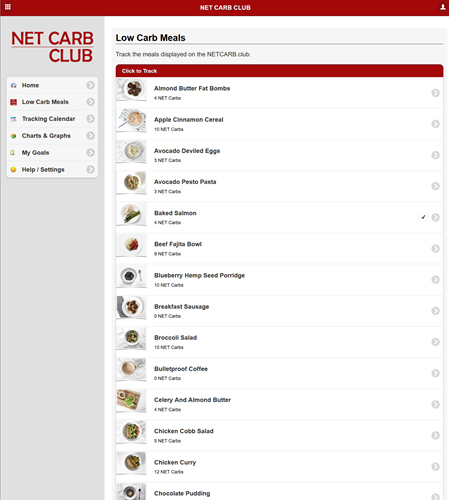 All of the low carb meals featured on NET Carb Club have been incorporated into their tracking program, providing a key link between their website and tracking program. Users can track these meals right from this page, which even includes the product images. Adding or removing foods is easily done from the control panel. They could have added an exercise table, more text, images and links to this page, but chose to keep it clean with their foods. Typically, you'll pick a nutritional category for your program to focus on, and for most companies, this is calories. The user can then decide if they like the simplified single-category approach or if they want to track all categories. In this case, since their brand is completely focused on NET Carbs, they've decided to make NET Cabs their nutritional focus, while disabling the ability to track any others. It really makes the tracking program customized and laser-focused on their brand. Once your program is set up, you can add a login box to your website if you wish, or simply send visitors to your link. After that, it's pretty much cruise control, we take care of site maintenance, lost passwords are handled by an automated system, you can even have users submit technical questions directly to us (your choice). We suggest you set your goals first, then hit the tracking calendar to track a few days, even if you put in fictional data. The charts and graphs really come to life as you track, but with no or little data, there's not much they can show! The custom page can also display an exercise tracking table, similar to the food table. It is not enabled on this project.